There’s a chill in the air. At this decidedly frostier time of year, our bodies need all the help they can get in the nutrient department – as well as something to leave us feeling toasty. 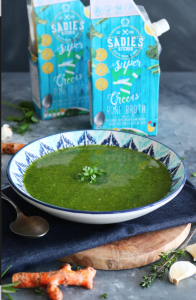 Luckily, this tasty recipe for Super Green Soup made using our Super 7s Geen Bone Broth – one sachet contains seven green vegetables in one swoop – and a few added ingredients is just what the doctor ordered – and delicious too. Sautée the chopped onion in the olive oil, add the garlic, turmeric and cayenne pepper. Next, add all greens and cover with bone broth. Blend until smooth and finish with black pepper, salt and lemon juice.